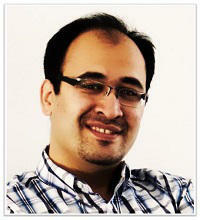 I worked at Barefoot Networks as a software engineer in the Advanced App team. I used the programmable switching hardware in non-traditional networking applications such as Deep Insight, In-network DDoS Detection, Matching string queries, Packet subscription and Machine learning acceleration. I got my PhD degree in Computer Engineering at USC under supervision of Ramesh Govindan and Minlan Yu in NSL from Fall 2010. I defended in July 2016, and my dissertation is about developing timely, accurate and scalable network management systems. Such systems allow operators to define high level intents and leverage efficient algorithms at the controller, switches and end-hosts. These algorithms can quickly fine tune the switches and end-hosts to keep high accuracy, drill down fast into issues, and leverage device optimizations and network knowledge to scale. I developed four systems: vCRIB (NSDI'13), DREAM (SIGCOMM'14), SCREAM (CoNEXT'15) and Trumpet (SIGCOMM'16). I got B.Sc. and M.Sc. degrees in Information Technology Engineering in 2007 and 2010 from Sharif University of Technology (Tehran, Iran). Please click on a project to see its description. Measurement tasks require significant bandwidth, memory and processing resources, and the resources dedicated to these tasks affect the accuracy of the eventual measurement. However, the resources are limited, and datacenters must support a variety of concurrent measurement tasks. OpenFlow counters using TCAM and Sketches using SRAM are two main measurement primitives. I developed DREAM for flow counters and SCREAM for hash-based counters to provide operators with the abstraction of guaranteed measurement accuracy that hides resource limits from operators. The insight is to dynamically adjust resources devoted to each measurement task and multiplex TCAM and SRAM entries temporally and spatially among them to support more accurate tasks on limited resources. The key idea is an estimated accuracy feedback from each task that enables iterative allocations. I proposed new algorithms to solve three challenges: (a) Network-wide measurement tasks that can correctly merge measurement results from multiple switches with a variable amount of resources. (b) Online accuracy estimation algorithms for each type of task that probabilistically analyse their output without knowing the ground-truth. (c) A scalable resource allocation algorithm that converges fast and is stable. In SDN, applying many high-level policies such as access control requires many fine-grained rules at switches, but switches have limited rule capacity. This complicates the operator's job as she needs to worry about the constraints on switches. I leveraged the opportunity that there can be different places, on or off the shortest path of flows, to apply rules if we accept some bandwidth overhead and proposed vCRIB to provide operators with the abstraction of a scalable rule storage. vCRIB automatically places rules on hardware switches and end-hosts with enough resources and minimizes the bandwidth overhead. I solved three challenges in its design: 1) Separating overlapping rules may change their semantics, so vCRIB “partitions” overlapping rules to decouple them. 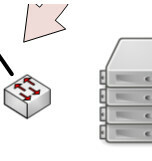 2) vCRIB must pack partitions on switches considering switch resources. I solved this as a new bin-packing problem by a novel approximation algorithm with a proved bound. I modeled the resource usage of rule processing at end-hosts and generalized the solution to both hardware switches and end-hosts. 3) Traffic patterns change over time. vCRIB minimizes traffic overhead using an online greedy algorithm that adaptively changes the location of partitions in the face of traffic changes and VM migration. I demonstrate that vCRIB can find feasible rule placements with less than 10\% traffic overhead when traffic-optimal rule placement is infeasible. SCREAM and DREAM can support 2x more tasks with higher accuracies than fixed allocation. With growing concerns of the cost, management difficulty and expressiveness of hardware network switches, there is a new trend of moving measurement and other network functions to software switches at end-hosts. I implemented a subset of measurement algorithms in software to re-evaluate their accuracy and performance for traffic traces with different properties. The results showed that modern multicore computer architectures have significantly increased their cache efficiency and cache size to the extent that it can fit the working set of many measurement tasks with a usually skewed access pattern. As a result, complex algorithms that trade off memory for CPU and access many memory entries to compress the measurement data structure are harmful to packet processing performance. Then I developed an expressive scalable measurement system on servers, Trumpet, that monitors every packet in 10G links with small CPU overhead and reports events in less than 10ms even in the presence of an attack. Trumpet is an event monitoring system in which users define network-wide events, and a centralized controller installs triggers at end-hosts, where triggers run arbitrary codes to test for local conditions that may signal the network-wide events. The controller aggregates these signals and determines if the network-wide event indeed occurred. Current SDN interface, OpenFlow, requires the centralized controller to be involved actively in any stateful decision even though the event and action happen on the same switch. 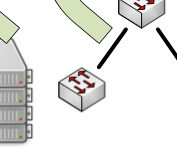 This adds 10s of ms delay on packet processing and huge computation overhead on the controller, which makes it hard for operators to implement middlebox functionalities in SDN. I proposed a new control primitive in SDN, flow-level state machines, that enables the controller to proactively program switches to run dynamic actions based on local information without involving the controller. I developed FAST, the controller and the switch architecture using components already available in commodity switches to support the new primitive. This motivated a collaboration with Tsinghua University on HiPPA  project that dynamically chains state machines in hardware and software in order to improve the performance of software-based middleboxes and the flexibility of hardware-based ones.